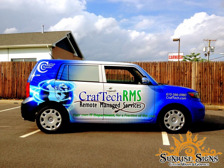 CrafTech Computer Solutions Boots Up Scion xb With Car Wraps in Delaware County PA! CrafTech Computer Solutions, located in Media Pennsylvania has been serving Delaware County for over 20 years! Their experienced staff is familiar with many network, software and Internet programs and they also specialize in custom-built solutions for both home use and business use.